The "future of Windows 10" implies a conceptual discussion, and not just a hardware reveal. 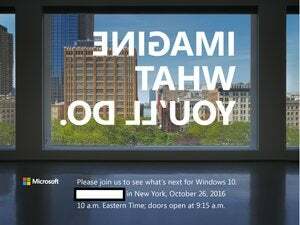 It’s official: Microsoft will hold an event in New York at the end of October where the company is expected to roll out a new Surface all-in-one PC. 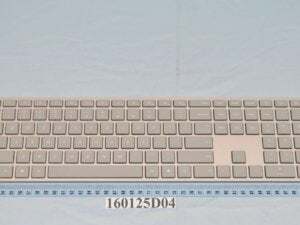 As we reported on Thursday, photos of a Surface-themed mouse and keyboard have already appeared in FCC filings. Interestingly, however, the term “Surface”—or even “hardware”—doesn’t appears anywhere on the invitation, which beckons reporters to a New York event on Oct. 26. Instead, Microsoft has invited reporters to “see what’s next for Windows 10,” which implies some sort of strategic update to the company’s software initiatives. “Imagine what you’ll do,” is written backwards on a window. 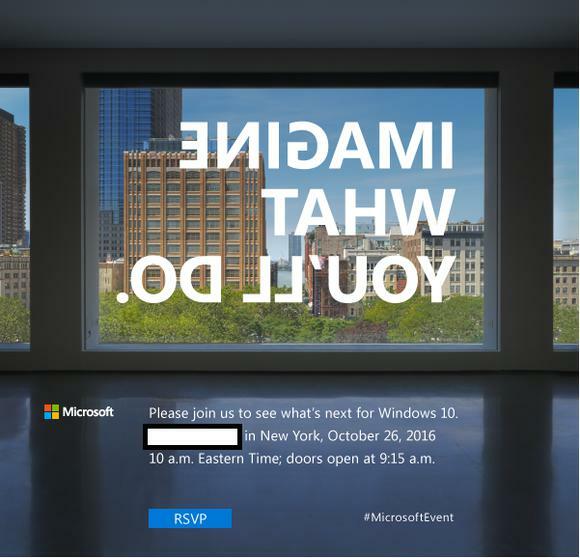 Microsoft is playing it close to the vest with its invitation, even labeling it “#MicrosoftEvent” on the obligatory hashtag. 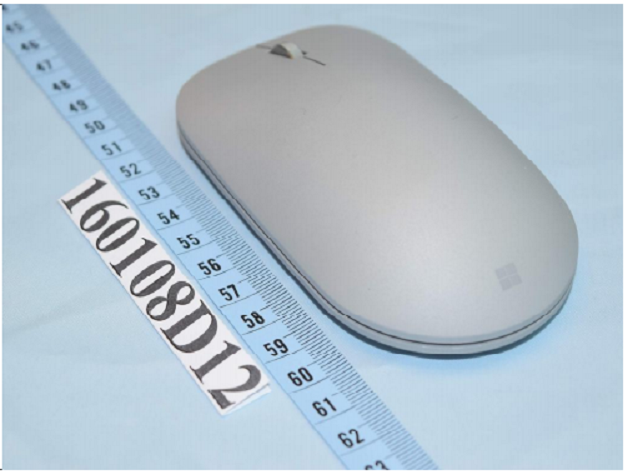 Microsoft submitted this mouse for FCC approval. Is it a Surface mouse? Why this matters: A new Surface would be meaningful enough. But the more important question is a simpler one: What is the future of Microsoft hardware? With the seeming demise of Microsoft’s consumer Lumia line, Microsoft’s down to two meaningful hardware families: the Surface tablets and Hub, as well as the Xbox lineup. Neither is expected to go away, though it’s not exactly clear what the “mobile” portion of Microsoft’s “cloud first, mobile first” mantra will mean over the next few years. Given that Microsoft’s next “Redstone” OS update isn’t expected until January or so, updating reporters on the state of Windows 10’s desktop OS isn’t necessarily expected. It seems reasonable, however, that Microsoft will offer up a sneak peek of upcoming features, as well as its plans for Windows 10 going forward. Part of that includes Windows 10’s role as “the last Windows,” so will Microsoft commit to a timetable of scheduled releases? How will it justify the cost of new licenses? Will support for Windows 10 iterations run out eventually? Microsoft just revamped its support structure for the enterprise, and it could do the same for consumers, too. A more pressing question will be the fate of Windows Mobile. Microsoft seems to be busy updating it, along with Windows 10 for the desktop. But how significant of a role will mobile play within Microsoft? Will third-party hardware makers be responsible for carrying the torch for Windows Mobile? Traditionally, Microsoft has highlighted contributions from its partners, and we’d expect that as well. That all leads up to a discussion of the fabled Surface phone: Is it real, and if so, when will it ship? 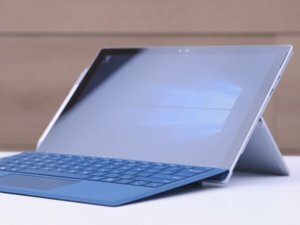 “Kaby Lake” upgrades to the Surface Pro 4 look like they’re not going to happen. All that will serve as a backdrop to what we believe is the real point of the event: the expected Surface all-in-one. A Surface-colored mouse and keyboard emerged in FCC filings this week, leading to the conclusion that a Surface AIO would soon follow. But what about rumored Kaby Lake upgrades to the Surface lineup? We’re hearing that won’t happen at this event. In any event, we’ll all find out in a few weeks’ time.